Centennial Park at Pelican Island National Wildlife Refuge has a wonderful covered bench overlooking a large pond, just perfect for chatting and watching the world go by. As friend Marilyn and I sat on said bench, she pointed out an interesting activity by some Snowy Egrets. As we watched, one would skim across the pond, dragging his toes in the water. As soon as he was finished, another one would take off, doing the same thing. I, of course, called Jim to see what was going on. Meanwhile, Marilyn snapped this photo. Turns out, this is a common Snowy Egret fishing technique. The closest name I could find to attach to it is "foot dragging" - you can read more about other techniques in the link below. Snowy Egrets have great big yellow feet, and they skim those yellow toes across the water in hopes that a fish or frog will think it is something tasty. I put out a call to "the guys" for illustrative photos, and as always, they came through. Matt contributed this beauty - you can see two spots where the toes have gone in, almost like a skipping stone. It was such a treat to watch these birds and their antics - they reminded me of a bunch of teenage skateboarders. They didn't work in pairs, they didn't seem to be much interested in eating, and they didn't interfere with other birds - they just waited their respective turn and took off skimming. What fun! 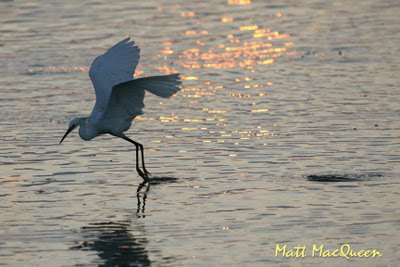 When they stir up something good, the Snow Egret can snag it in mid flight. 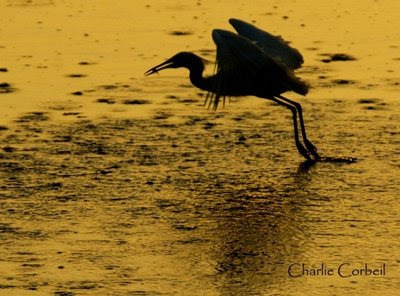 Lucky for us, Charlie Corbeil snagged this photo and shared it. I haven't noticed this "foot dragging" behavior. How interesting. Mostly I observe snowies in a salt-water environment and this behavior seems to happen in fresh water ponds, based on what I'm reading. I wonder if anyone has seen them doing this in a saltwater environment?